A private office is a room separated from the open area by walls or partitions. 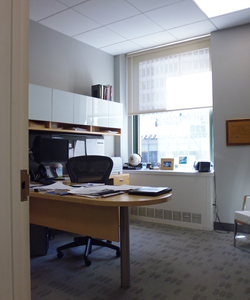 The private offices are mostly regarded for top executives. The office layout can set the tone for the productivity and efficiency of the business. Different work environments require a variation of office designs. While many creative businesses opt for an open office design to foster teamwork and creativity. On the other hand, certain businesses enjoy the privacy of an office intensive design. There are many points to examine when deciding the best office design for your business. A private office space relates esteem, status, and accomplishments. A private office acknowledges a person’s position and standing within the business. As more people personalize and stylize their private office space creating the best working atmosphere. Private offices also convey a great image to clients and guests. Accomplished employees whom hold meetings, such as, interviewing new employees and external partners, often occupy private office. There are many advantages to a private office design instead of an open office design. In an open office design, noise levels may become a distraction. A private office will allow employee to avoid distractions. An open office plan without separation allows for phone conversations, employees conversations, and other interactions to interfere with work. Private offices also provide space that is more personal for employees in the office. Instead of a small cubicle in a shared space, the private office provides an individual desk, cabinets, and shelving for your own. The private office allows people to organize their space and assist with paperwork and clients. One of the beneficial feature of a private office is the status and sense of accomplishment to employees. Normally an employee with authority receives a private office and granted larger space through promotions. Private offices symbolizes an upward career marker for many employees. 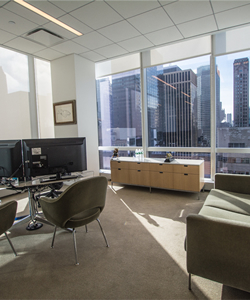 Private offices are typically portrayed as a status symbol especially in the business world. A business with focus on upward mobility would benefit from the private office design. Whether you are searching for a space with focus on private offices or just looking for more information, we can assist you on the pros & cons of private offices. We can analyze your requests ensuring you get the best lease/purchase possible. Contact us anytime with no obligation or fee.